If you have courage and you are not afraid of heights, then you can afford to walk on this very special transparent glass skywalk in your visit to Tianmen Mountain, the second national forest park in Zhangjiajie region, China. Conquer the fear to not look down but to look ahead to see what’s in front of you! In front of you, you’ll enjoy breathtaking views of the unique and colorful humanistic natural landscape of Tianmen Mountain Park and Zhangjiajie. 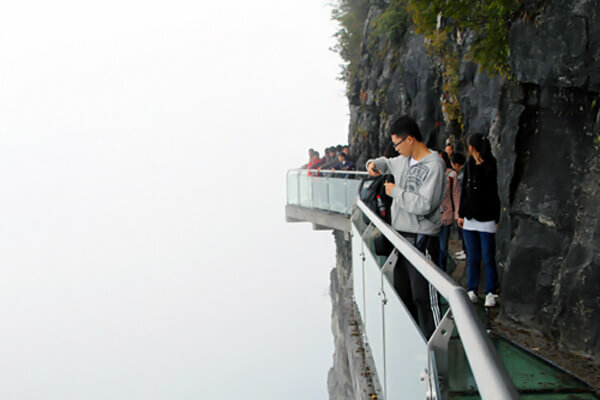 Located 4,700 ft (1,430 m) above sea level on the side of Tianmen Mountain, the 2.5 inch crystal-clear glass pathway is an excellent attraction for brave tourists looking for adrenaline. Measuring approximately 200 feet (61 meters) long, it offers walkers a vertigo-inducing look at the sheer drops and wilderness below, but also terrifying thrills. Everyone can cross the platform with one condition: to wear shoes covers in order to keep the glass surface clean and without scratches. Suspended from a cliff face, this amazing glass walkaway will surely make your experience unforgettable. Photos: © Ding Yunjuan/Xinhua Press/Corbis, Dingyun Juan. Putting this one on the bucket list! Hey there! I know this is kinda off topic but I was wondering if you knew where I could find a captcha plugin for my comment form? I’m using the same blog platform as yours and I’m having trouble finding one? Thanks a lot! I was just looking for this info for some time. After six hours of continuous Googleing, at last I got it in your site. I wonder what’s the lack of Google strategy that don’t rank this kind of informative sites in top of the list. Generally the top web sites are full of garbage.